There's no shortage of showy bicycle storage, but if you want something neat and discreet, Hurdler Studios' Clug seems to be the little bicycle rack that could. 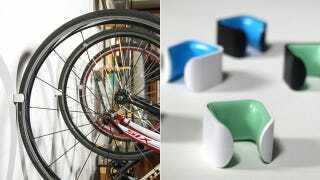 Currently a Kickstarter, the Clug—named after the noise it makes—is a small, wall-mounted clip. The bracket conceals two screws, which hold the things to the wall, and then a push-fit inner clips straight into hide them. The thing is shaped to allow most road bike wheels to simply click into place. You can either mount the brackets low, so your bike stands on its two wheels, supported by the Clug, or mount it higher so your bike rests on its back wheel and has its front wheel held in place. This latter option looks, at first glance, like your bike is hanging neatly from the wal—with nothing to support it other than a tiny, cubic clip.You know better, though.